Looking for the right gift for the uncle that has everything? Do you need a unique corporate gift idea? Who wouldn’t like to receive fresh, delicious, homemade cookies at their home every month? Cookies range from 1.65 – 2.25 oz. each depending on ingredient weights. One dozen of the never fail flavor of the month will be shipped the first week of each month to the recipient of your choice. Cookies will be shipped on consecutive months from the starting month of your choice. 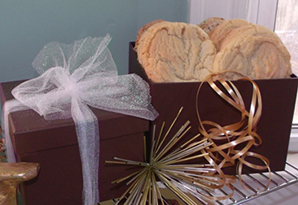 Cookie gift boxes and ribbons may vary with the season and always include your personalized message. Convenient 3, 6 or 12 month option. USPS Priority 2 – 3 Day Shipping is included in all Cookie of the Month plans. Alternate flavor choices are available upon request. Organic substitution upgrade now available for $5.00 per dozen. Check out our ingredients for details. Choose length of subscription and month to begin.